Many of our customers want to “Extend” or “Connect” their WiFi signal to their shop, garage, barn or other out-building on their property. Most people instantly want to put in a full WiFi bridge, just go to a couple hundred feet. Stop wasting your money on full bridge kits and keep reading, because RadioLabs is introducing the most unique Wireless extension system since the technology was invented. RadioLabs get the same calls every day from our customers, who need to connect their shop, barn or garage to their home’s WiFi router. Before they even get the words out, our technicians already know how to respond. Extending your home WiFi network to any building on your property has never been this easy. The problem with this, is that the low-powered devices, such as weak cell phones, laptops, security cameras, tablets and 99% of consumer w devices on the market, simply do not have the power, antenna or range needed to reach back to their Home WiFi Network. Routers and home Access Points have very small internal antennas. The tiny antennas inside of these devices are generally lucky to go even 300 feet, let alone put a dedicated wireless link in directly to your home’s WiFi Router. What is needed, is a powerful “Client – Router” device, with an external antenna that’s powerful enough to permanently connect to your home’s Router.. or any router or access point for that matter. At that point, you will have an excellent connection to your home router or source of internet, but then another device to rebroadcast, or, “Repeat” or a localized Access Point is needed inside of that building. That’s where RadioLabs’ new o2Surf WiFi Extender System comes into play. This kit, has every single device needed inside the kit, to be able to permanently link the remote building, to your home Network router! 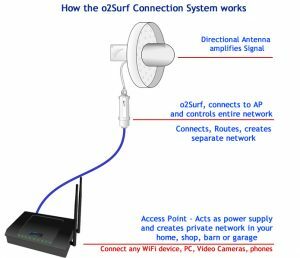 The o2Surf Connection system allows you to Scan, Select and Link any building in range to your existing WiFi Router or Access Point. Our powerful Wireless Client/Router unit, can link any outbuilding to your home Router in minutes! What you need to correctly link any outbuilding to your WiFi network, is a powerful “Wireless Client” device, with a high power antenna that’s strong enough to extend your outbuilding to your home Router, or any router or access point for that matter. At that point, you will have an excellent connection to your home router or source of internet, but then another device to rebroadcast, or, “Repeat” or a localized Access Point is needed inside of that building. That’s where RadioLabs’ new o2Surf WiFi Connection System comes into play. This kit, has every single device needed inside the kit, to be able to permanently “Tether” or link the remote building, to your home WiFi router! How Powerful is the o2Surf Connection Kit – Will it extend WiFi to my building? RadioLabs Building connection Kit, has AMAZING range. If your building , barn, shop or remote outbuilding is within a few hundred yards and your home router is powerful enough to even give a perceivable, 1-2 bar signal at 50-100 feet outside your house, our kit will connect and give you up to a 150 MBPS WiFi link to virtually any building. This kit is built to save you money, provide a stable link, and save the cost of having to put in a full bridge kit. Well, what happens if I have metal siding or don’t have WiFi that will reach outside of my house? Well, there’s 2 options. Buying a high power WiFi Router, or if you install our kit and it doesn’t work, you can always purchase the rest of the kit to complete your WiFi bridge. Worst case scenario, you’ll have to spend another $170 plus a CAT-5 Cable to finish of a true point to point bridge. But, our kits have been successful in 9 out of 10 installations. If you have any questions about range, click the live chat box below and we will tell you if we think it will work, but in most cases, unless you’re planning on going 1/2 mile through trees, have metal siding on your home, or have an unusually weak router, our kit will likely establish a VERY good link. Most of RadioLabs’ High Power WiFi devices, have excellent sensitivity and transmit substantial power. In fact, most of the time, it’s more powerful than the Access Point or WiFi device you’re trying to connect to, so, for example, standing ½ mile away from one of RadioLabs WiFi Omni Antenna kits, with a Cell Phone or Laptop, you may see 3 or 4 bars, but have a hard time extending back to it. This is where the WiFi Connection System comes into play and will link any building to your home WiFi Network. This is usually called a “Point to Point” link, or, a “Point to Multi-point” link if you have more than one building connected back to one access point. While this task seems rather simple, in reality to do it right, is not an easy task and there is not one single device to do it properly. Everyone tries to “Repeat” the signal, or wants to have one simple device that will both connect to your home, plus repeat the signal out in your shop, garage or barn. “WiFi repeaters” have been out in the market for a long time and use a technology where you have to program and connect them, but then they aren’t always compatible with your home router and the results are disastrous. They will slow down your network, decrease your speed and make your WiFi network more complex than it needs to be. RadioLabs solves this WiFi problem in a brilliant fashion, by providing one of the most ingenious solutions on the market. We have a robust, high power, easy to program solution, which allows our customers to mount our External WiFi Extender kit, aka: o2Surf – Backfire WiFi Extension kit, which allows you to install one simple kit on the remote building, which is powerful enough to reach all the way back, connect to your home router and provides a localized Access Point inside of the remote building. Instead of trying to connect your low-powered WiFi Device several hundred feet away, or using WiFi Repeater or plug in the wall extenders (most of which do not work at all and slow down your signal even when they do), our WiFi Building extension kit, allows you to connect several hundred feet away, reaching all the way into even the lowest power home router and connecting in minutes. In 3 simple steps, you can put a fully functional high speed network in any building. Use our Quick connect system, to instantly find, connect and secure the link. 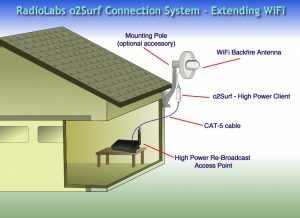 Our simplified guide, easy, pre-secured network access point, and an outdoor WiFi radio, that operates in 2 modes at once, our o2Surf Connection System, allows you to quickly and easily connect to ANY access point and provide a stable, high power WiFi link into the buildings on your property, with excellent speed, stability and amazing stability. 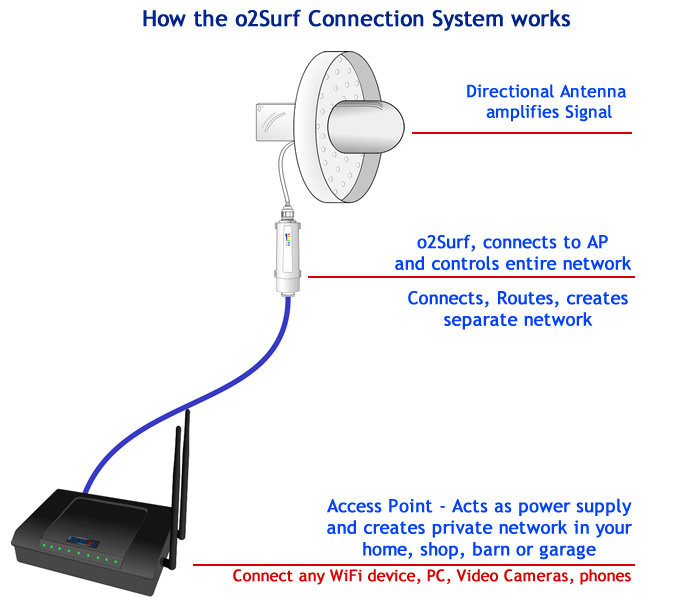 Utilizing customized programming we developed, our o2Surf Connection System, reaches out to your home router, access point or quite literally any 2.4 GHz signal, even through trees and obstructions, connecting to your home router. Our kit then creates its own fully functional high speed sub-network, allowing you to connect up to 250 separate WiFi or wired devices to our high power access point included in the kit. How do you connect your WiFi Extender Kit? What’s Involved? RadioLabs makes the programming on our WiFi building extender kit easier than anything on the market. With a pre-configured solution, pre-encrypted AP solution, and 1 page connection, RadioLabs makes it so easy to connect your barn, shop or any outbuilding to your home Router or Access Point, customers with absolutely no experience in WiFi are able to get on any device, cellphone, tablet or notebook, connect to our Access Point, type in a pre-encrypted unique password given to each kit, enter our menu screen, go to our site survey page, find your home network, select it and Activate. That’s it. No changing IPs, no default gateway hassle, nothing. We’ve had customers with absolutely zero networking knowledge, armed simply with the knowledge of how to connect to a WiFi signal and open a browser tab, follow our quick programming guide and connect multiple buildings in minutes. How hard is this to program? 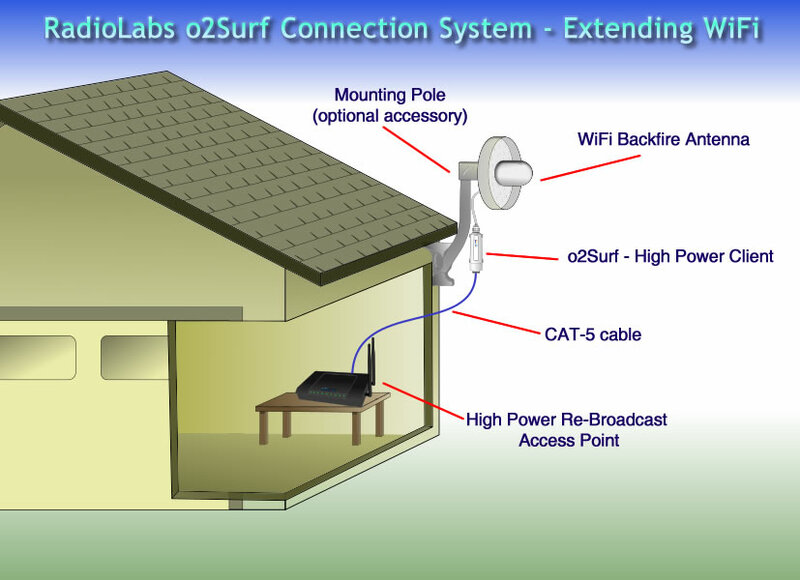 RadioLabs o2Surf, high power client / router / AP / Bridge / Repeater, is the most reliable outdoor WiFi device on the market. We’ve had so few failures on this product, it has truly become the backbone of RadioLabs Wireless systems. RadioLabs new software, called the “Ultra System” makes this not only possible, it makes it the easiest programmable wireless networking device on the market, with ability to connect to any WiFi System, and turn it into your own home network. We can’t release exactly what we’ve done, because we are after all a business, but this unique programming mode is exclusive to RadioLabs and with this single kit, will make you the envy of the technical neighborhood, being able to connect virtually any building to ANY WiFi System. Yes, this single kit can be used to connect XFinity Wifi, Brighthouse, literally any cable company WiFi network, to capture this signal and bring it into your home or office. In the end, your network will act like they ran cable straight to your home. More articles coming on this later.